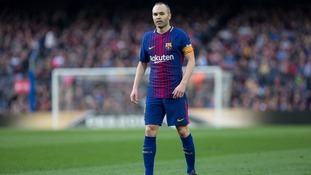 A number of Premier League clubs could be put on alert after Andres Iniesta admitted he is still undecided whether he will leave Barcelona at the end of the season. The 33-year-old midfielder, who signed a lifetime contract at the Nou Camp in October, is unsure whether he can still perform at a good enough level for the LaLiga outfit. He has been linked with a move to China, while clubs in England would also be interested in one of the most decorated players in recent history. Iniesta, who is involved in Spain's national team ahead of friendlies with Germany and Argentina, said on Spanish radio station Cadena SER: "I haven't decided 100 per cent if I am going to stay or not. "If I stay, it will be because I can perform at 200 per cent. "If I leave, it will be because I can't give the 200 per cent that the club deserve from me. That's the doubt I have. "I'm at the club of my life, the one which has given me everything, the affection of the people... this situation is not easy, but also I understand that I am already at an age and all things change and other doors open that are very exciting in many ways. "It will not be a question of love or not, it's a question of what I decide to do, if I leave it will be because I cannot give 100 per cent as a player and as a person to my club." On a potential destination if he does call time on his Barca career, Iniesta added: "All scenarios are possible, all scenarios are possible where Barca do not compete (against the new club)." Iniesta has played 33 times for Ernesto Valverde's side this season.